Make sure all the notes and alterations you've got swimming around in your head have a home with our Sticky Notes Large Neon and Pastel Packs. These functional additions to any office or workplace have been made from brightly coloured paper which contrasts well with both black and blue ink and stands out on a white background. Presented in an assortment of neon and pastel colours, these notes have been cut to a large shape allowing for more detailed information to be jotted down while the adhesive strip on the back easily affixes to most hard surfaces. 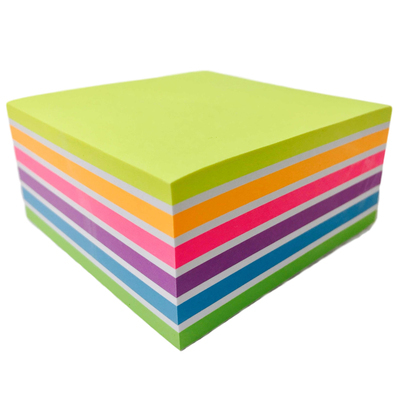 Whether you're annotating a book for your next class or jotting down some notes for that all important meeting, these Sticky Notes are an essential to your work stationery kit. While you're here, why not stock up on other essential stationery items to make you and your colleagues lives as easy as possible? We have everything from ballpoint pens, A4 Copier Paper and A4 Refill Pads to keep your stocks high while our A4 Ring Binders ensure your office is always at its peak of organisation and tidiness.